We pulled up stakes in the KOFA wilderness and headed to the town of Quartzite for some much needed housekeeping and then on to Blythe CA to shop for groceries — the closest full-service grocery. On a previous trip we had found the RV Pitstop to be a reasonable place to dump, fill our water tanks, and get RO drinking water. Just north on 95 is a landfill transfer station where we were able to get rid of our trash. In Blythe we were able to fill, over fill, our very empty refrigerator. Then it was west along I-10. Very arid area, dust storms hiding some of the distant mountains. We took the the Joshua Tree NP exit. 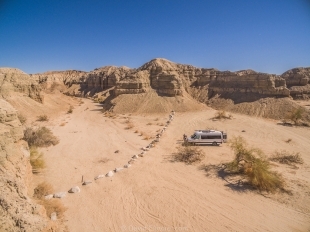 We are not going to Joshua Tree, but heading south on Box Canyon Road where there are some BLM campsites in among the canyons. We had driven through this area in 2015 on the way to visit Amanda who was rowing at the Chula Vista Olympic Training Center. On that trip we were in a hurry so we just drove through and admired the the scenery but were unable to stay long. We found a lovely pull off and went for a walk before dinner. The canyons are wide with plenty of evidence of past rains. The rocks are highly erodable. We like the site and even though we are in amongst the rocks, we have some AT&T phone reception and data when the phone is in the booster cradle.